What is Cat Litter Box Cover and Cabinet? The Cat Litter Box Cover and Cabinet hides your cat's litter box messes while also providing you with an organizational piece of furniture. The Cat Litter Box Cover and Cabinet is large enough to fit most litter boxes, including extra large automatic boxes. Additional cat supplies (litter and scoop) can also be stored inside. The white paint finish complements most home decor Note: Product does not include litter box pan. The Cat Litter Box Cover and Cabinet is an attractive piece of furniture to hide your cat's litter box. 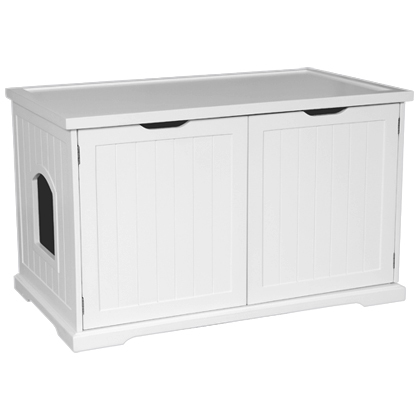 This piece of furniture can also be used as an organizational space to store litter and other cat supplies. Insert 4 Wooden Dowels (K) to connect Back Panel (B) to Side Panels C1, C2. With the help of another adult, carefully lower Back Panel B and sides C1 and C2 onto Bottom Board A2. Insert 6 Wooden Dowels (K) into Top Panel (A1) and carefully lower onto assembled bench base. Insert 7 Cams (I) and tighten carefully. Place Covers (L) over installed Cams. Slide Divider (C3) into desired location. Attach Left Door (D1) and Right Door (D2) using 8 Screws (M) onto the pre drilled holes.